The Stapleton neighborhood master developers thought of everything when they included this 5 acre off leash dog park in South End. 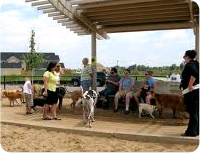 The Stapleton neighborhood dog park includes one large enclosure for dogs of all sizes, with sand, benches and a water spigot for thirsty Fido. It also has fire hydrants, shade for the owners and easy street parking. If you own a dog, like most folks in Stapleton do, then you will enjoy the Stapleton neighborhood dog park. It is located on the South-East side of Syracuse, between 20th and 23rd. Begin your search for Stapleton homes for sale here.